Arg-e Karim Khan, or the citadel of Karim Khan, was the residence of Karim Khan who ruled Iran between 1750 and 1779 and founded the Zand dynasty. It was built between 1766 and 1767 and resembles a square fortress with four 14m high circular towers at each corner. The walls are 12m high and enclose an area of 4000 sqm. Inside the citadel lies an inner court with citrus trees. 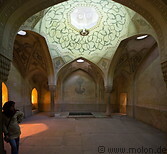 Inside the rooms there were paintings made with gold powder, which however were largely destroyed when the Arg-e Karim Khan was used as a prison for a number of years. 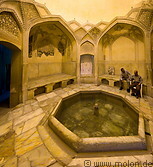 A (no longer in use) public bath is located in the compound.